June asked me to repost this because somehow the ocmments got locked out the first time, and there was no one to post today anyway. So comment away! 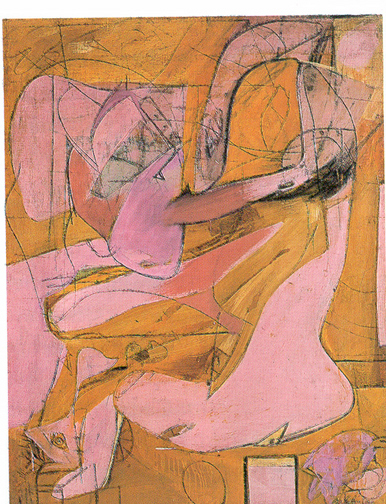 I have been enjoying Ann Eden Gibson’s book Abstract Expressionism Other Politics. Early on she makes the point that originality was a key element for these artists: “‘Derivative,’ mused Louis Bourgeois. “That is the worst word, just about the worst.” (p 24). However, as Gibson points out, “The criterion of originality was so arbitrary, so contradictory and so subjectively applied that it could boomerang . . .” (p. 22). This set me on a path of thinking about my own perspective on originality, and how complicated and difficult it seems to me to assign originality to an artist. 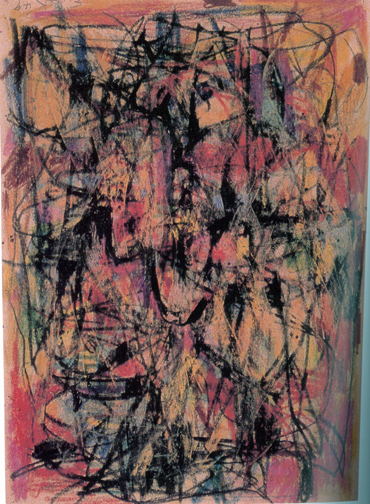 I am sure you all instantly recognized the painting above as being Jackson Pollock. His style is original and distinctive isn’t it? 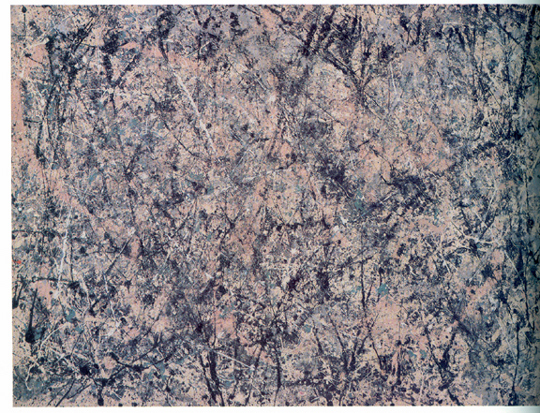 I love Pollock’s work. 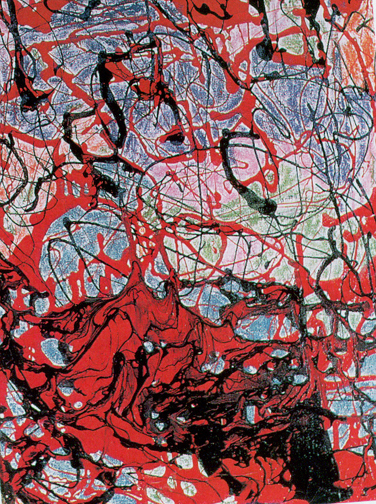 Is her work as strong as Pollock’s? as interesting? as original? as good? Are these two paintings similar? Which was done first? Which is more original? Does that matter to you in terms of judging each painting’s worth. Does name recognition influence you (pro or con)? What do you think of the above work ? Is it strong and original ? Is it Abstract Expressionism? 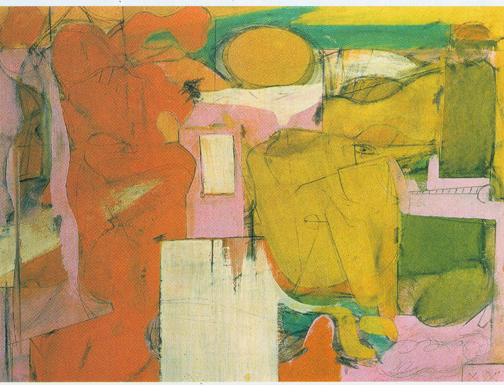 It was not thought to be so in its day — because the work is Elaine deKooning’s and her work was considered to be derivative of her husband’s, whether or not she worked in a style prior to his having done so! As artists, how much of what we do is consciously or unconsciously derived from the work of others? Is this a bad thing? Isn’t much of it inevitable? How do we judge our own work and the work of others? Do we instantly think — “Original is good!” or “Derivative is bad”? And how do we actually know when work is original? (How many imitation Nancy Crow’s have you seen — even at QN???) How is our work judged by critics and juries? How are we influenced by that judging (whether it is fair or not)? I’m surprised no one has commented on this topic. Is it hitting too close to home? My reply is late only because I’m behind on my blog reading. Borrowing, stealing, being influenced, this has been going on in the art world for centuries. I don’t think it is all bad. We have to learn somewhere. But serious artists should then be able to put their own unique spin on their work. There’s also a finite number of images to work with. Just how many ways can you arrange pond lilies? Even if your inspiration was not Monet, because his are so well known, everyone will assume anything similiar is derivative and think less of that work. I know I’ve done it myself. Then there are the times I thought I had a totally original idea. How depressing then, to discover someone else has already done it, I wasn’t fast enough, or the idea so universal as to be impossible to be original. Again, it’s the artist’s spin that has to make it unique. Not an easy thing. I think this may be why so much emphasis is put on “doing the work” and not worrying about judges, juries, even the buying public. With any luck, if you truly are doing the work, you will emerge with art recognizable as yours alone.